I have spent the past 2 months trying to perfect and be able to easily recreate a rimmed soap design and finally have a technique down that works pretty consistently. A rimmed soap is a soap that has a band of soap surrounding an inner soap core. The design potential for the rim is endless - from a solid color, to a swirl and even being able to add more decorative elements on the surface. These soaps are a two day process. Day 1 to make the soap for the rim and day two to cut and mold the rim and make the soap for the inner core. I do not scent the outer rim to keep it easy to work with without have to deal with issues that some fragrance oils can bring to your soap. 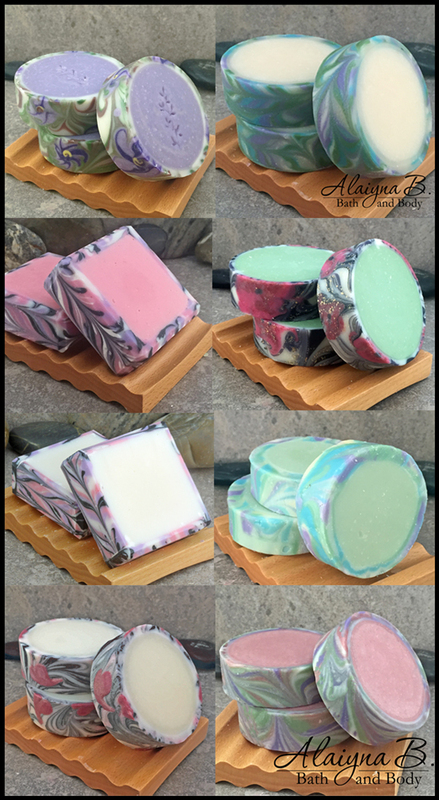 These are all cold process soaps but can also be done with melt and pour or a combination of the two - I have not tried those yet. Below is a collection of the rimmed soaps I have been successful in making. Some were part of the trial and error process and others from successful recreations of the technique I used. Just lovely, and very creative. I am very impressed with all of these! Great job! I can not wait tutorial. Thank you! Impressive, looking forward to your tutorial. These are beautiful! Is it possible to use melt and pour for both the rim and inside parts?